When an Issue is created in Enterprise Server, it can be given a setup that is independent from the Brand that it belongs to. This way, it can make use of its own Workflow Statuses, Editions, Categories, Routing Rules, and more. Note: This is done by selecting the option 'Overrule Brand' on the Issue Maintenance page. Issues that are set up this way are referred to as 'Overruled Issues'. In order for these overruled Issues to be displayed in Content Station, an Enterprise Server plug-in needs to be enabled. Step 1. Access the Server plug-in page. Step 2. Enable the plug-in named Content Station Overrule Compatibility by clicking the Unplugged icon . It changes to a Plugged In icon . Note: Overruled Issues are represented as their own Brand with one Issue, meaning that if one Brand has been set up containing 2 overruled Issues, they appear as 2 separate Brands in Content Station. The naming format used is <Brand name> <Issue name>. Example: In a Brand named 'xTreme', 2 overruled issues have been set up, named 'Year in Review 2012' and 'Year in Review 2013'. 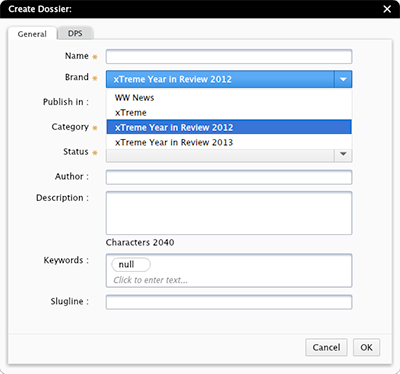 In the lists of Brands (such as the one in the Search Application or in a Check-in dialog box), these will appear as separate entries: 'xTreme Year in Review 2012' and 'xTreme Year in Review 2013'.